Park position switch detects that CVT shift selector is in the P (Park) position and then transmits the signal to BCM and IPDM E/R. BCM controls INTELLIGENT KEY SYSTEM (ENGINE START FUNCTION), NISSAN VEHICLE IMMOBILIZER SYSTEM-NATS (NATS), and VEHICLE SECURITY SYSTEM. BCM performs the ID verification between BCM and Intelligent Key when the Intelligent Key is carried into the detection area of inside key antenna and push-button ignition switch is pressed. If the ID verification result is OK, push-button ignition switch operation is available. 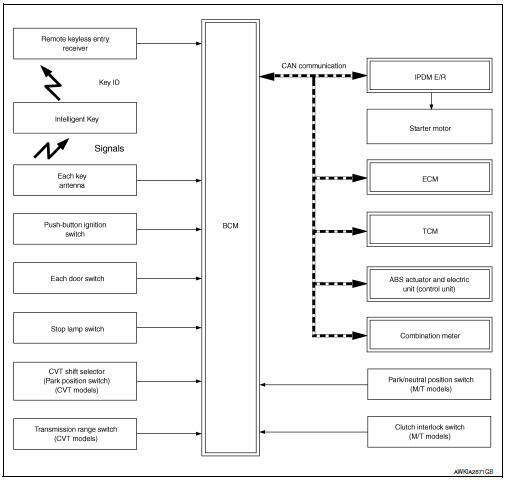 Then, when the power supply position is turned ON, BCM performs ID verification between BCM and ECM. If the ID verification result is OK, ECM can start engine. When power supply position is turned ON, BCM starts communication with ECM and performs the ID verification between BCM and ECM. If the verification result is OK, the engine can start. If the verification result is invalid, the engine can not start. IPDM E/R has the starter relay and starter control relay inside. Starter relay and starter control relay are used for the engine starting function. IPDM E/R controls these relays while communicating with BCM. The ID verification is performed between BCM and transponder in Intelligent Key via NATS antenna amp. when Intelligent Key backside is contacted to push-button ignition switch in case that Intelligent Key battery is discharged. If the ID verification result is OK, the operation of starting engine is available. Combination meter transmits the vehicle speed signal to BCM via CAN communication. BCM also receives the vehicle speed signal from ABS actuator and electric unit (control unit) via CAN communication. BCM compares both signals to detect the vehicle speed. Door switch detects door open/close condition and then transmits ON/OFF signal to BCM. Outside key antenna detects whether Intelligent Key is outside the vehicle and transmits the signal to BCM. Three outside key antennas are installed in the front outside handle LH, front outside handle RH and rear bumper. Inside key antenna detects whether Intelligent Key is inside the vehicle and transmits the signal to BCM. Three inside key antennas are installed in the instrument center, console and trunk room. Remote keyless entry receiver receives each button operation signal and electronic key ID signal from Intelligent Key and then transmits the signal to BCM. Each Intelligent Key has an individual electronic ID and transmits the ID signal by request from BCM. Carrying the Intelligent Key whose ID is registered in BCM, the driver can perform, remote start, door lock/ unlock operation, remote liftgate, panic alarm and push-button ignition switch operation. Push-button ignition switch detects that push-button is pressed and then transmits the signal to BCM. BCM changes the power supply position with the operation of push-button ignition switch. BCM maintains the power supply position status while push-button is not operated. Security indicator lamp is located on combination meter. Security indicator lamp blinks when power supply position is any position other than ON to warn that NISSAN VEHICLE IMMOBILIZER SYSTEM-NATS (NATS) is on board. Engine starting system functions by controlling both starter relay and starter control relay. Both relays are integrated in IPDM E/R. Starter relay is controlled by BCM, and starter control relay is controlled by IPDM E/R on request from BCM. IPDM E/R transmits starter relay and starter control relay status signal to BCM via CAN communication. Stop lamp switch detects that brake pedal is depressed, and then transmits the signal to BCM. 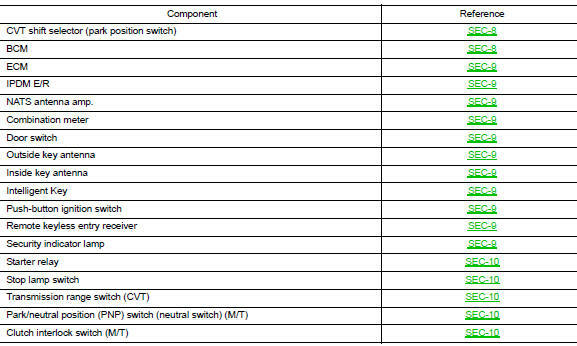 Transmission range switch is integrated in CVT assembly, and detects the CVT shift selector position. TCM receives the transmission range switch signal and then transmits the P/N position signal to BCM and IPDM E/R. Park/neutral position (PNP) switch detects that shift lever is in the neutral position, and then transmits ON/OFF signal to BCM. Clutch interlock switch detects that clutch pedal is depressed, then provides power source to starter control relay and starter relay, and transmits ON/OFF signal to BCM. The engine start function of Intelligent Key system makes it possible to start and stop the engine without using the key, based on the electronic ID verification. The electronic ID verification is performed between BCM and Intelligent Key when the push-button ignition switch is pressed while the Intelligent Key is within the detection area of inside key antenna. The driver should carry the Intelligent Key at all times. Intelligent Key has 2 IDs (Intelligent Key ID and NATS ID). It can perform the door lock/unlock operation and the push-button ignition switch operation when the registered Intelligent Key is carried. If the ID is successfully verified, when push-button ignition switch is pressed the engine can be started. Up to 4 Intelligent Keys can be registered (Including the standard Intelligent Key) upon request from the customer. Refer to SEC-14, "NISSAN ANTI-THEFT SYSTEM : System Description" for any functions other than engine start function of Intelligent Key system. The transponder (the chip for NATS ID verification) is integrated into the Intelligent Key. (For the conventional models, it is integrated into the mechanical key.) Therefore, ID verification cannot be performed by mechanical key only. In that case, NATS ID verification can be performed when Intelligent Key backside is contacted to push-button ignition switch while brake pedal is depressed. If verification result is OK, engine can be started. When the push-button ignition switch is pressed, the BCM activates the inside key antenna and transmits the request signal to the Intelligent Key. The Intelligent Key receives the request signal and transmits the Intelligent Key ID signal to the BCM. BCM receives the Intelligent Key ID signal via remote keyless entry receiver and verifies it with the registered ID. BCM turns ACC relay ON and transmits the ignition power supply ON signal to IPDM E/R. IPDM E/R turns the ignition relay ON and starts the ignition power supply. IPDM E/R turns the starter control relay ON for engine starting in advance. BCM detects the selector lever position and brake pedal operation condition (CVT models), or clutch pedal operation condition (M/T models). BCM transmits the starter request signal to IPDM E/R and turns the starter relay in IPDM E/R ON if BCM judges that the engine start condition* is satisfied. Power supply is supplied through the starter relay and the starter control relay to operate the starter motor. If a malfunction is detected in the Intelligent Key system, the вЂњKEYвЂќ warning lamp on the combination meter illuminates. At that time, the engine cannot be started. When the Intelligent Key is carried outside of the vehicle (inside key antenna detection area) while the power supply is in the ACC or ON position, even if the engine start condition* is satisfied, the engine cannot be started. *: For the engine start condition, refer to вЂњIGNITION SWITCH POSITION CHANGE TABLE BY PUSH-BUTTON IGNITION SWITCH OPERATIONвЂќ. Engine can be started when Intelligent Key is inside the vehicle. However, sometimes engine may not start when Intelligent Key is on instrument panel or in glove box. When Intelligent Key battery is discharged, NATS ID verification between transponder in Intelligent Key and BCM is performed when Intelligent Key backside is contacted to push-button ignition switch while brake pedal is depressed. If the verification result is OK, engine can be started. 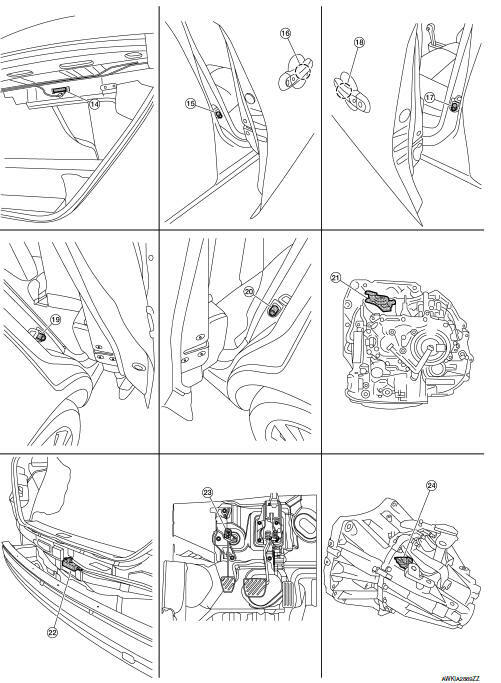 The ignition switch position can be changed by the following operations. When an Intelligent Key is within the detection area of inside key antenna or when Intelligent Key backside is contacted to push-button ignition switch, it is equivalent to the operations below. The Nissan Anti-Theft System (NATS) prevents the engine from being started by Intelligent Key whose ID is not registered to the vehicle (BCM). It has higher protection against auto theft involving the duplication of mechanical keys. The ignition key integrated in the Intelligent Key cannot start the engine. When the Intelligent Key battery is discharged, the NATS ID verification is performed between the transponder integrated with Intelligent Key and BCM via NATS antenna amp. when the Intelligent Key backside is contacted to push-button ignition switch while brake pedal is depressed. If the verification result is OK, the engine start operation can be performed by the push-button ignition switch operation. Locate the security indicator lamp and always blinks it when the ignition switch is in any position except ON to warn that the vehicle is equipped with Nissan Anti-Theft System (NATS). Up to 4 Intelligent Keys can be registered (including the standard ignition key) upon request from the owner. When replacing ECM, BCM or Intelligent Key, the specified procedure (Initialization and registration) using CONSULT is required. Possible symptom of NATS malfunction is вЂњEngine can not startвЂќ. This symptom also occurs because of other than NATS malfunction, so start the trouble diagnosis according to GI-35, "Work Flow". If ECM other than genuine part is installed, the engine cannot be started. For ECM replacement procedure, refer to EC-485, "Removal and Installation". The ID registration is a procedure that erases the current NATS ID once, and then registers a new ID. Therefore before starting the registration operation, collect all registered Intelligent Keys from the customer. When registering the Intelligent Key, perform only one procedure to simultaneously register both IDs (NATS ID and Intelligent Key ID). Security indicator lamp warns that the vehicle is equipped with NATS. Security indicator lamp always blinks when the ignition switch is in any position other than ON. Because security indicator lamp is highly efficient, the battery is barely affected. When brake pedal is depressed while selector lever is in the P position (CVT models), or selector lever is in the Neutral position (M/T models), the BCM activates NATS antenna amp. that is located behind pushbutton ignition switch. 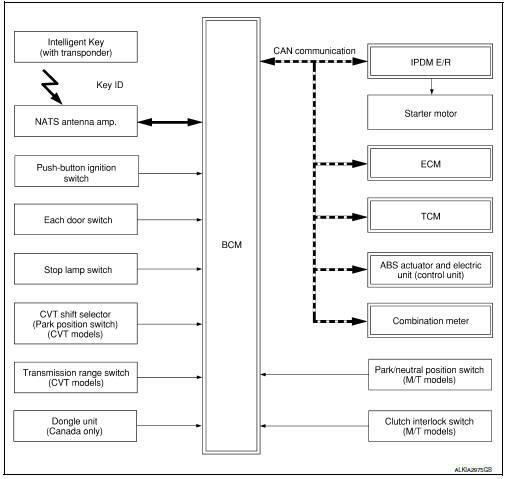 When Intelligent Key (transponder built-in) backside is contacted to push-button ignition switch, BCM starts NATS ID verification between BCM and Intelligent Key (transponder built-in) via NATS antenna amp. When NATS ID verification result is OK, buzzer in combination meter sounds and BCM transmits the result to ECM. BCM turns ACC relay ON and transmits ignition power supply ON signal to IPDM E/R. BCM detects that the selector lever position and brake pedal operation condition (CVT models), or clutch pedal operation condition (M/T models). BCM transmits starter request signal to IPDM E/R and turns the starter relay in IPDM E/R ON if BCM judges that the engine start condition* is satisfied. 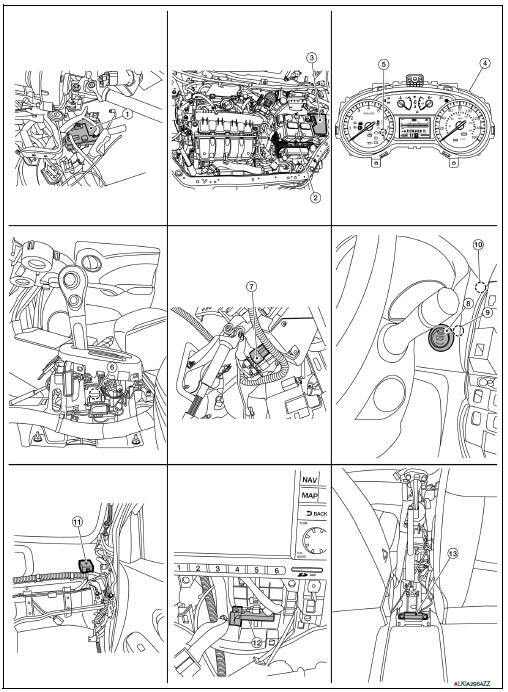 *: For the engine start condition, refer to вЂњIGNITION SWITCH POSITION CHANGE TABLE BY PUSH-BUTTON IGNITION SWITCH OPERATIONвЂќ below. The panic alarm does not start when the theft warning alarm is activating and the panic alarm stops when the theft warning alarm is activated. Security indicator lamp on combination meter always blinks when power supply position is any position other than ON. Security indicator lamp blinking warns that the vehicle is equipped with a vehicle security system. To lock/unlock all doors by operating remote controller button of Intelligent Key or door request switch, Intelligent Key must be within the detection area of outside key antenna. 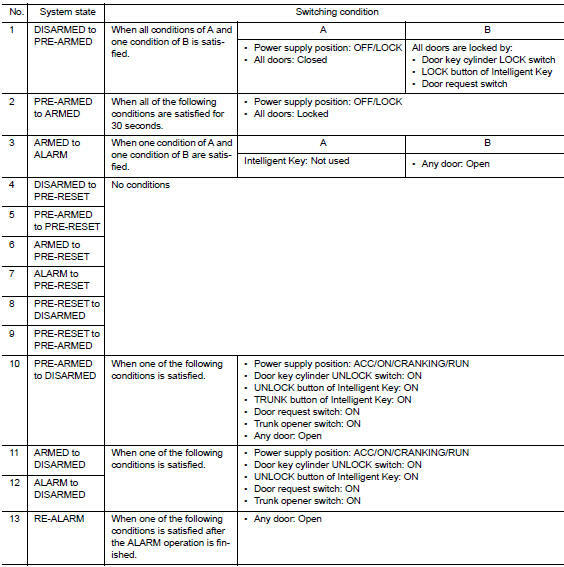 For details, refer to SEC-11, "INTELLIGENT KEY SYSTEM/ENGINE START FUNCTION : System Description". To open trunk by operating trunk opener switch, Intelligent Key must be within the detection area of outside key antenna. For details, refer to SEC-11, "INTELLIGENT KEY SYSTEM/ENGINE START FUNCTION : System Description". The vehicle security system is not set in the DISARMED phase. The vehicle security system stays in this phase while any door is open because it is assumed that the owner is inside or nearby the vehicle. Security indicator lamp blinks every 2.4 seconds. The PRE-ARMED phase is the transient state between the DISARMED phase and the ARMED phase. This phase is maintained for 30 seconds so that the owner can reset the setting due to a mis-operation. This phase switches to the ARMED phase when vehicle conditions are not changed for 30 seconds. Security indicator lamp illuminates while being in this phase. The vehicle security system is set and BCM monitors all necessary inputs. If any door is opened without using Intelligent Key, vehicle security system switches to the ALARM phase. Security indicator lamp blinks every 2.4 seconds. The panic alarm function activates horns and headlamps intermittently when the owner presses the PANIC ALARM button of Intelligent Key outside the vehicle while the power supply position is OFF or LOCK. When BCM receives panic alarm signal from Intelligent Key, BCM transmits вЂњTheft Warning Horn RequestвЂќ signal and вЂњHigh Beam RequestвЂќ signal intermittently to IPDM E/R via CAN communication. To prevent the activation due to mis-operation of Intelligent Key by owner, the panic alarm function is activated when BCM receives the signal for 0.4 - 0.6 seconds.